Arabian horses are known for their beauty, spirit and versatility, and all of these characteristics are on display this week in Tulsa, Okla. The 2013 U.S. Arabian and Half-Arabian National Championship Horse Show (commonly called U.S. Nationals) is the grand finale of the American Arabian show circuit and this year runs from Oct. 18-26. Here are some things to know about this year-end championship. National championship titles will be awarded for many show divisions, including park, English pleasure, western pleasure, hunter pleasure, and more. Arabians also compete in hunters, jumpers, dressage, and carriage driving, but those championships are contested at a separate event: the U.S. Arabian and Half-Arabian Sport Horse Nationals. You may not think of the Arabian as the classic cowboy horse, but U.S. Nationals holds classes for purebred and half-Arabians in reining, cutting, working cow and reined cow. This year, U.S. Nationals has expanded its western offerings with a ranch sorting event, being held as an exhibition this year. The most popular class at this year’s national, based on pre-entries, is the Arabian Western Pleasure Select, Adult Amateur to Ride Championship. You won’t see too many yellow ribbons at U.S. Nationals. Most classes recognize a Champion, Reserve Champion, and Top Ten. The show doesn’t award specific placings beyond second place. Half-Arabian championship titles will be awarded in Tulsa this week, but some popular Arabian crossbreeds, including the National Show Horse (Saddlebred/Arabian) and Morab (Morgan/Arabian) have their own national championships. This year, Morab Nationals is being held at the same time as Arab Nationals, Oct. 19-20 in Lexington, Ky.
Arabians have a few unique classes that aren’t seen in most other breeds. 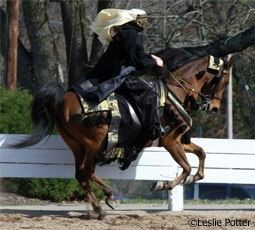 Native costume classes see horses and riders decked out in elaborate Arabian-inspired costumes and are judged at the walk, canter and hand gallop (no trotting.) In liberty classes, horses are judged as they move around the ring without tack or direct guidance. Liberty classes are also seen at Miniature Horse shows and occasionally for other breeds. U.S. Nationals takes place across three arenas at the Tulsa Expo Square. All three arenas are available for viewing via live webcast at ArabianHorseGlobal.com. 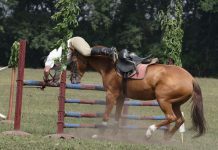 For more information about U.S. Nationals, visit ArabianHorses.org/USN. Glad to see that cutting, reining, and cattle working will be shown. Arabs make wonderful working partners. 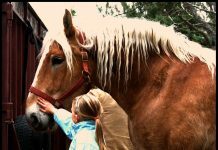 Beautiful horses and it takes special person that can understand them.